Just acquired this saw which is in excellent shape. Not sure what size (length) blades to use nor how to connect them. Top chuck does have two set screws to hold blade; screws missing on bottom chuck. I have tried to find a manual, but no luck. Out of print. Any one have a manual of info? I bought an older scroll saw at a sale. I'm sure it will work if I could find some blade holders. After I got it I discovered they were not there. I took it to Sears and they found it in their computer and they told me that it is no longer made so I could not get the parts from Sears. My email is gefulghum@yahoo.com. I'd like some feedback on this. I would rather like to talk on the phone and if you respond to this by email and include your phone number, I will call you. I searched all of Chicago for the blades. Finally cut some coping saw blades to fit. They work fine. 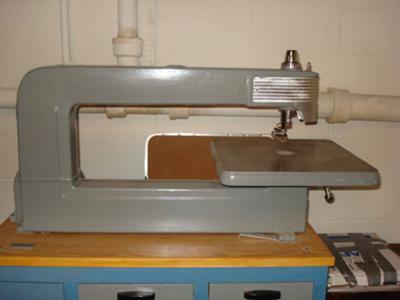 8-30-09: Just got a Sears Scroll saw 103.23390 at an auction last week. Not sure where to get a copy of the manual or purchase blades, but let me know if you get information.....and I'll let you know if I come across anything. Posted picture on this site.